Since April, Native Americans have been gathering in North Dakota to show solidarity with the The Standing Rock Sioux tribe. Hundreds of protestors from around the country are now peacefully standing in opposition to the Dakota Access Pipeline. It is the biggest gathering of Native Americans in over a century. The proposed pipeline crosses the Missouri River, meaning a spill would contaminate the water source - and livelihoods - of thousands. The pipeline also runs along a path over many ancestral sites, threatening places of cultural and spiritual significance. And, it directly contributes to global warming by transporting oil, a dirty fossil fuel. More science than ever confirms the threat of climate change, which is caused by burning fossil fuels. This pipeline threatens the water and immediate future of the Standing Rock Sioux people. It also contributes to a warming climate, harming many generations to come. Pipeline spills are common, and can sometimes release hundreds of thousands of gallons of oil. They deeply contaminate water, kill animal species, and destroy important ecological habitat. In 2013, a Tesoro Logistics pipeline spilled over 864,000 gallons of oil on a farm in North Dakota. Similar leaks have occurred throughout the country, including one that contaminated the Kalamazoo River in Michigan. The price tag for that incident was over one billion dollars to clean the river and surrounding areas. This weekend, attack dogs and pepper spray were used at the pipeline protest site to silence voices that are now heard across the country. Some videos and accounts show 6 peaceful protestors injured, including a child. 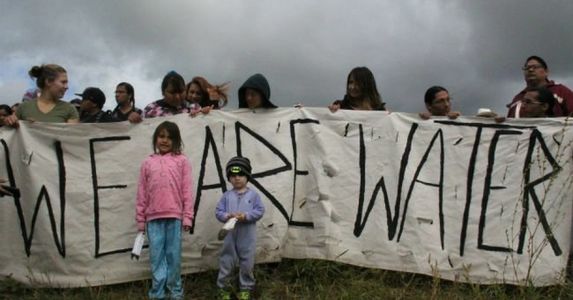 The only way to end this injustice is to permanently stop the construction of the pipeline. Doing so would halt brutality against protestors and prevent the destruction of sacred sites and important water sources. Sign now to demand the end of construction of the Dakota Access Pipeline. Since April, Native Americans have been gathering in North Dakota to show solidarity with the The Standing Rock Sioux tribe. Hundreds of protestors from around the country are now standing in opposition to the Dakota Access Pipeline. It is the biggest gathering of Native Americans in over a century. The proposed pipeline crosses the Missouri River, meaning a spill would contaminate the water source - and livelihoods - of thousands. The pipeline also runs along a path over many ancestral sites, threatening places of cultural and spiritual significance. And, it directly contributes to global warming by transporting oil, a dirty fossil fuel. More science than ever confirms the threat of climate change, which is caused by burning fossil fuels. This pipeline threatens the water and immediate future of the Sioux people. It also contributes to a warming climate, harming many generations to come. This weekend, attack dogs and pepper spray were used at the protest site to silence voices that are now heard across the country. Some videos and accounts show 6 peaceful protestors injured, including a child. The only way to end this injustice is to permanently stop the construction of the pipeline. Doing so would halt brutality against protestors and prevent the inevitable destruction of sacred sites and important water sources. After nearly a year, and Trump’s new order, #noDAPL camps are being cleared by the police water protectors have set some of the camps on fire as they are forced out and arrested. The campaign continues however: A DC march has been planned for 3/10 - more info here. If you can’t attend, make sure to support #BankExit NOW. Tuesday, September 13 is #NoDAPL day of action. There are events all over the world. Join or plan one near you! The Department of Justice has just stepped in and sided with the Standing Sioux Tribe to halt construction! But the fight is not over. Keep signing and sharing to stop the pipeline once and for all.